Appearance: Sylvester clocks in at three and a half feet tall and is thickly built. The front of his body is covered by shaggy looking light tan fur. His most distinguishing feature however lies on his backside, which is covered with overlapping, diamond shaped, inch-long, dark brown scales. These run from his forehead down his back and cover his broad tail. His eyes are a dark brown that match his scales. His attire mainly consists of a rough, hand-made brown leather cloak with a hood and matching backpack. On the back of the cloak there is a light blue design of a Kokopelli. He also wears a belt under the cloak with a knife sheath and pouches for money and his whetstone. Typically seen sticking out of his simple pack would be the neck of a hand-carved mandolin. Personality: Sylvester is a kind and caring soul and would no sooner hurt someone than throw away his personally made knife or mandolin. This comes from growing up in his small forest village. Rarely was there any sort of strife in his small forest village, and thus Sylvester never got a chance to develop any bitterness to the world. Another advantage Sylvester has gained from his upbringing and training is an immense well of patience and an eye for details. Having spent so long honing his skills as a woodsmith and carver, he has learned that sometimes you need to spend hours on even the smallest detail in order to get it right. It would take quite a deal to completely unsettle him. He also has the soft and slow tone of one raised in such tranquility. Backstory: Sylvester was born and raised in a small village deep in the Wood Zone. From a very early age, he was apprenticed to the village’s woodsmith, starting off with basic jobs such as hauling in fresh lumber and sweeping away the sawdust and other refuse from crafting. In return, the master woodsmith and his journeyman taught him the basics of handling and maintaining a knife, as well as other wood working tools. It was long, monotonous work, but Sylvester didn’t mind it at all, knowing that the knowledge he was gaining was worth it. His work was broken up once every other season (Spring and Fall) when a traveling minstrel came to the village on his route around the countryside. Sylvester had always enjoyed the tales he told and songs he sung, but one Spring, when Sylvester was 12, the minstrel actually came to visit him, or at least the woodsmith he was apprenticed to. One of the minstrel’s instruments had broken on the pathway when he had tripped over an errant stone. The master took the job, and left to go work on it, allowing Sylvester to take some time off to listen to the minstrel’s stories. The minstrel took interest in the young pangolin, never before seeing up close such a strange looking Mobian, one with fur as well as scales. After the minstrel took a break for a meal, he turned his attention from playing to a grand audience to spending some time with the kids of the village, Sylvester included. He’d teach them the basics of dancing and singing, as well as playing instruments. Most of the kids just goofed off, plucking or blowing randomly at the instruments, but Sylvester took it as seriously as any other task given to him and took to some of the stringed instruments quickly, his first display of his nimble fingers. The minstrel took note of this (pardon the pun), and told the young pangolin that he’d have a special surprise for him during his next visit. And so the spring turned into summer. Sylvester continued his duties as an apprentice, occasionally getting the chance to help with carving some details into a piece or making a rough shape for the master to hone and finish. He was coming along nicely and the master was considering promoting him to a journeyman soon, but before that could happen, fall arrived, and with its coming came the minstrel. This time around, the minstrel presented Sylvester with a guitar-sized stringed instrument, but the body was shaped like half a teardrop and the neck was shorter, with pairs of strings instead of just single ones. The minstrel mused, “I friendly little Pangolin deserves a friendly little mandolin.” Sylvester gratefully took the gift and started practicing with it right away. However he did not let this get in the way of his normal duties as the woodsmith’s apprentice, despite the smith allowing him some spare time off to practice. And so time went on for a while… Sylvester grew into an exceptionally talented young man, balancing his music and his woodcrafting. The minstrel still made his semiannual rounds, and Sylvester was privileged enough to accompany him for a few songs during some of his later stops. The smith promoted Sylvester to a journeyman at the age of 18. And the cycle of everyday life continued, until Sylvester had turned 26. That fall, Sylvester had the day off and waited by the front gate to the village for his friend to arrive. And he waited, and waited, and waited, but the minstrel never came. Concerned, Sylvester turned to the village elder, who allowed a few of the men of the village to go out and search. They searched the surrounding forest for the next few days, but found no sign of him. The people of the village were starting to grow despondent; the minstrel was one of the few things to break up the monotony of everyday living. Fearing for the morale of the village, Sylvester took up the rough, old mandolin and started playing in the village center. He wasn’t quite as good as the minstrel, and he didn’t know as many songs, but he played his heart out. The people of the village slowly gathered around Sylvester. Soon, the whole village was there, singing and dancing, just like they used to. With a satisfied smile, Sylvester accepted his new role within the village and began concentrating on writing new songs. Sylvester carried on like this for some time, working on woodcarving projects and new musical pieces. He was well on his way as a journeyman and would be up for consideration for a promotion to master soon. His only concern was what to make as his masterpiece. Inspiration struck as he was practicing a song on the mandolin given to him by the minstrel. One day while practicing, the neck of the old and well-worn instrument snapped. Sylvester knew of ways to fix it, but decided instead on what his masterpiece would be, a personalized, hand-carved mandolin. He put down his music and immediately went out into the forest to find the right tree to fell for his new instrument. He spent weeks agonizing over every little detail, making sure that every cut was right, every angle was perfect. He poured his soul not only into the form, but the function, carving the whole thing out of one single piece of wood. He spent days carving out the sounding hole and interior of the body of the mandolin, striving to get each string to make that one crystal clear, perfect note. 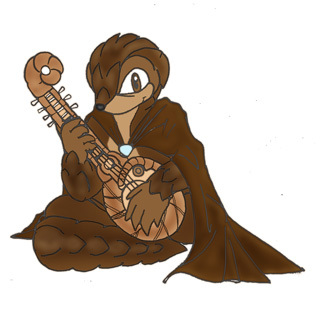 He spent as much time and effort on the outside as well, detailing the front of the mandolin to look like a non-Mobian version of a Pangolin, the body curving around the sounding hole, and the tail curling into a loop at the top of the neck. As he finally strung the instrument and plucked the first notes, he said a little prayer for his minstrel friend. A week later he presented his masterpiece and was officially given the title “Master Woodcrafter” at the age of 34. Shortly thereafter, he made the biggest decision of his life. Wishing to discover the fate that had befallen his friend, he packed his few belongings, a carving knife, an ax, and his mandolin. He commissioned a cloak bearing a mark like the one the minstrel wore, and set off on a trek across Mobius, planning to visit the towns and lands that the minstrel spoke of in prose and verse. Eventually, he followed the yarns and tales he had heard from the minstrel until he found himself in Capitol City. Abilities: Attire – A hand-made set of a brown cloak, belt, and backpack. The backpack is for storing larger items, like his axe and mandolin, while the belt gives Sylvester easy access to his carving knife, money, and whetstone. The cloak bears a large mark on the back in blue dyed leather resembling a Kokopelli. The minstrel has a similar mark on his cloak, and Sylvester hoped that someone would recognize the mark and have information for him. It would be plain for most people to see the rough leather and simplistic construction of it. Woodsman Tools – Sylvester’s two best friends are his carving knife and axe. The knife is roughly seven and a half inches in length and sports a carved wooden handle. The blade extends into the handle as well to keep it from breaking off easily. This was his gift from his master when he became a journeyman. The axe is just a plain woodcutter’s axe with a leather cap to go over the head of it. This was given to him as he left the village. He keeps both of these in prime condition and constantly sharp. Woodcrafting – Sylvester wasn’t given the title of Master for nothing. While specializing more in smaller carvings and detail work, it’s safe to say that he knows how to construct and repair most sorts of wooden items. Also, given a few minutes, maybe more depending on the complexity, to study an item, he can carve an accurate replica of it. Too bad that most items aren’t made of wood. Mandolin – This was hand-carved as Sylvester’s masterpiece out of a single piece of wood, save for the tuning pins. The face is carved to look like a pangolin, as seen here. Performing – Sylvester has picked up a number of songs to play on his mandolin on his travels, as well as writing some on his own. Thanks to a long period of hard work and practice, he has become quite good at playing them, too. While he prefers his mandolin, he can pick up and play most stringed instruments quickly, if not very well. Spindash – Sylvester’s spindash is more like a spinjog or spintrot. Along his travels, he met an old armadillo who tried teaching Sylvester how to do it, however Sylvester isn’t as young as he used to be, and couldn’t quite get the hang of it. The best he could manage was a short spin in place before he lost it and started rolling forward slowly. However, Sylvester is very tough in his rolled-up form, as this places his scales all on the outside. Technology – Sylvester’s been around enough places to know that no, those are not little people trapped in a magical mystery box. However, he is still wary of most mechanical things as he doesn’t really understand quite how they work yet, nor does he really desire to. Comments: Thanks to Terrifel for allowing me to use his design for the mandolin.